The Seattle native has come close to winning locally in recent years. He finished second to Bernhard Langer in the 2010 U.S. Senior Open and has finished third twice in the Champions Tour’s Boeing Classic. SNOQUALMIE — Fred Couples had no idea what was at stake Tuesday when he got to the 18th hole with a few friends at Broadmoor Country Club in Seattle. The Seattle native eagled that hole to shoot an 11-under 59, a course record from the blue tees. Where: TPC Snoqualmie Ridge, par 72, 7,264 yards. Field: 81 Champions Tour pros. 2014 winner: Champions Tour Rookie of the Year Scott Dunlap beat out Mark Brooks in a sudden-death playoff. Tickets: $20-$60 (also half-price tickets for seniors). 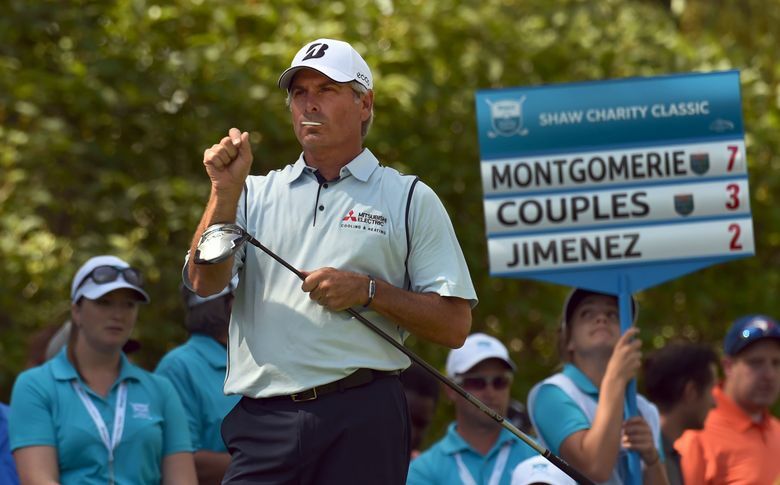 TV: Golf Channel, Friday, 6-8 p.m. (delayed); Saturday and Sunday, 2-4 p.m.
It’s no wonder then that Couples, 55, said he likes the state of his game as he opens play Friday in his continuing quest to win the Boeing Classic at TPC Snoqualmie Ridge in front of his hometown fans. Couples has come close to winning locally since turning 50. He finished second to Bernhard Langer in the 2010 U.S. Senior Open and has finished third twice in the Boeing Classic. He has been very open about what it would mean for him to win here. Couples took a long break after missing the cut at the Masters in April, as his chronic bad back was acting up. That forced him to skip sectional qualifying to get into the U.S. Open at Chambers Bay, something he had planned to do. Couples returned to the Champions Tour in July and has been in the top 10 in each of his three events since coming back, including a tie for fifth at the U.S. Senior Open. He opens Friday’s tournament at 1:10 p.m. on the first hole and is paired with Langer and Champions Tour rookie Jeff Maggert, who has won three times this season. Couples admitted he has thought about how many more chances he might have to win, but mainly he is thinking more short term. While in Seattle, Couples stays with longtime friend John Bracken, who this summer won the Pacific Northwest Senior Men’s Amateur.